Shots on many subjects, some of which were taken just a day or so prior to posting and others which were taken at other times. I appreciate your comments on my images, both old and new. Thanks! 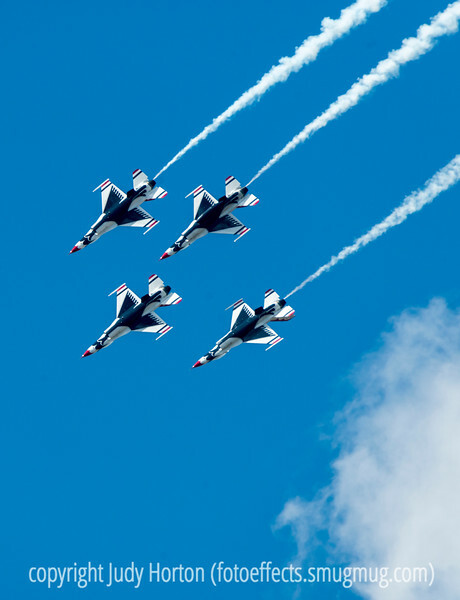 Terrific capture of the Thunderbirds in formation. These flying birds look so beautiful !! I'd love to see them in action ! Fine capture ! I hope to see them some day. I've seen them on TV, but I know that's not the same as in person. Now that I'm footloose and fancy free, I'll try to make that happen. Thanks for your retirement wishes. The amazing feats that these Air Force Men are able to defies all logic! By the way, I've mentioned it before, but I have a first cousin the military (Air Force) who is stationed in San Antonio, TX now. He will be retiring in November of this year (2018)! Always a spectacular sight, I'm sure. A new class of airmen trained to keep us all safe (or at least safer). We (the country) need all the help we can get. Great capture of the Thunderbirds in action.